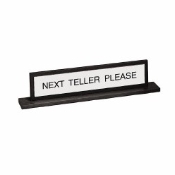 Available with attractive formica nameplates, these great looking signs feature nameplate on one side, and a choice of Next Teller Please or Next Window Please on reverse side. Both nameplates are adhesively mounted to the aluminum backplate connected to base. Non-slip adhesive backed cork is applied to bottom of base. Includes one line of copy on each nameplate. 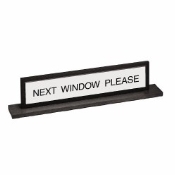 Size: Nameplate 8 1/2 x 1 1/2 Base 10 1/2 x 1 1/2.